First of all, I have to say thank you (times a million!) to everyone who has taken the time to congratulate me on our grand announcement this month. I wish I could thank every single one of you in person, but alas! All of your well-wishes and shared excitement means so much. I may say it often, but it's true. + I received some absolutely wonderful handmade Christmas gifts this year—including a gorgeous blanket, knitted by my mother-in-law, as well as the above infinity scarf, knitted by Jay's aunt. These beautiful gifts have inspired me to crochet my first full-size blanket this year, as well as either a hat or a scarf. Obviously, this is where Pinterest comes in…so, if you want to take a peek at projects that have been catching my creative eye, be sure to follow my crafty goodness board! + I just finished the best fiction book I've read in years: The Age of Miracles, by Karen Thompson Walker. I don't know what caught my eye about it at the library (I hadn't even heard of it before then!) but I'm so glad I went with my gut and checked it out. I hated when it was done and wished it had a sequel. So good! Read it. Read it now. + One of my favorite bloggers, Whoorl, recently posted a tutorial on how to give your hair messy waves with a flat iron, and I must pass it on. Years ago she posted a video on how to curl your hair with a flat iron and it kind of changed my life forever. I can get a head full of loose waves in less than ten minutes and it's a total game changer. + I always look forward to the weekly Stuff You Should Know podcast, and recently they had an episode on homeschooling. I didn't listen to it for a while, because I anticipated it would be a bit snarky or possibly reinforce negative stereotypes, but I was pleasantly surprised. Not only did they do thorough research, but they handled the subject objectively and offered a ton of facts that not even I was aware of. Even if you weren't homeschooled and aren't planning on homeschooling your own kiddos, it's an awesome listen—if only to shed some light on a lifestyle not many people know much about! + If any of you are still interested in the ePantry offer I posted about earlier this week, be sure to take advantage this weekend! The free shipping + $10 credit offer will be good through Sunday at 6PM (PST). If you sign up after that time, you will still receive a $10 credit on your account, but will pay shipping on your order. Any questions, ask away! 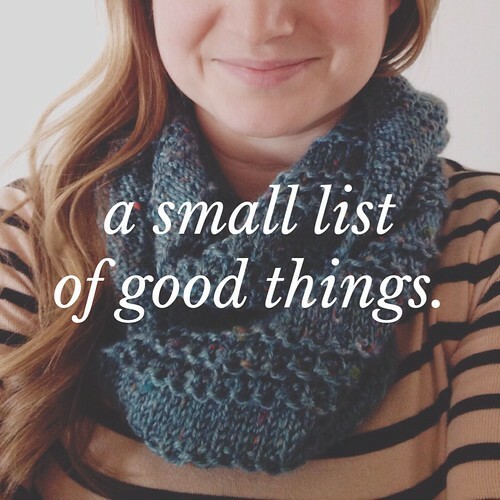 — Further reading: Other small lists of good things.